Setting up grow lights in your home can be done in many ways. Most indoor grow light options found online and at various retail stores are typically expensive. The reason is the frame that will be used to support the bulbs. 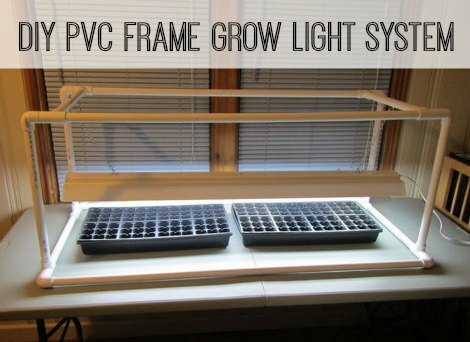 You can easily build your own grow light system that can be used on a table or any counters in your home using PVC pipe. The materials you will need to make the frame for your grow light system are available at a local home improvement store. Various pieces will be needed to make a suitable frame. The goal is to build a basic frame in the shape of a box that can easily be moved to another location when needed. You have a few choices to make when you are building a DIY grow light system. This includes the process of assembly for how you attach all the parts for the frame. If you want to frame to be rigid, then glue can be used. Another important detail is the tools that you need to build a basic grow light system. The tools can also be found at a home improvement store if you do not have any at home. Cutting all your pipe can be done using various types of saws. The tools used to build the frame for a grow light system will depend on what you may have on hand, ease of use, and safety. A power drill is another tool that is needed for you to complete this project. You may find a modification or two can easily be made to make a grow light system better. This is one of the main benefits of a DIY project that is done at home. However, a simple frame may be all you need for growing various types of plants in your home.